Please recall that the US 10th Circuit Court of Appeals ruled that the “Fenster” lawsuit (“Kerr vs. Hickenlooper”) to declare TABOR unconstitutional under the US Constitution could move to the trial phase. Attorney General John Suthers asked the US Supreme Court to review that case, arguing that such an issue is NOT for the courts to decide, but instead is a political issue. Your TABOR Foundation (sister organization to the TABOR Committee) joined the national office of NFIB to file a friend-of-the-court brief (an amicus) on the motion asking the Supreme Court to take up the appeal. The arguments presented in this brief just nail the issue, and I am proud to be associated with this effort – I want to stop people in the street and show them what a great read this is (scroll down to page 17 to start). If you have questions about the process or the content of what we are trying to accomplish, please know that you may contact me by email or by phone. Local Government STOPS listing to the Citizens they allegedly represent? When Local Government tries to take on Millions more in long term Debt – spanning (2) decades to pay it all back? When Local Government plans to “pay off decades of Debt” by using the 2% (RETT – Real Estate Transfer Tax) – levied against all real Property in Avon? The answer is…Avon Patriot Citizens “Petition their Local Government” – (and with a sufficient number of Avon Voters, signatures…you can legally force a “special election” either/or their Town Council can Repeal their Ordinance that authorized Millions more in Debt. 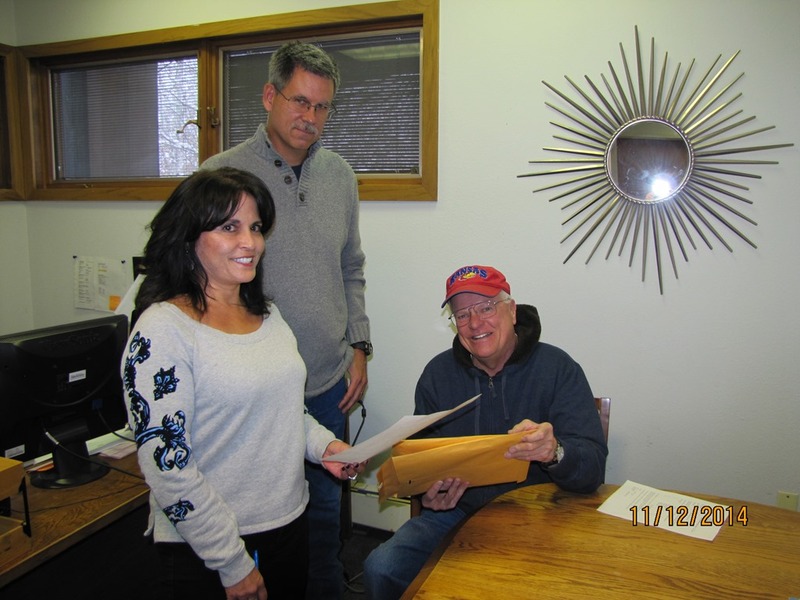 Dave Strandjord shown here returning 233 Avon Signatures – to be verified by Avon Clerk Debbie Hoppe. This week (17-21NOV2014) Avon Voters should know the results of this Petition Drive. Stand by. More News from the ECT shortly. Dateline: Tuesday, November 18th 2013 – Avon’s Grass Roots Citizens ‘Petition for Referendum’ has (for now) stopped the out going Avon Council from taking on millions more in long term DEBT!Their plan was to pay for this Millions in proposed/new DEBT by using the 2% (RETT – Real Estate Transfer Tax) that is attached to all REAL PROPERTY in the Town of Avon.What next? Answer: Avon’s new Council (to be sworn in tonite) – has only (2) legal options they can exercise – now that Avon’s Clerk and Record (Debbie Hoffe) has issued her legal “Certificate of Sufficiency” (based on the Citizens signature Petition) stopping the Avon Council’s plan. Option 1: Repeal (read kill) the Avon Ordinance that was used to authorized the new DEBT. Option 2: Hold a “special election” and let registered Avon voters make the final decision. The Nuclear Option? Yes, there is one other legal possibility that (Avon Finance Manger – Scott Wright – does not support)…the “possibility” that Avon Council could vote to take $3.5 Million (out of Avon’s General Fund) and buy the “Building for Avon Bureaucrats” (also known as the Skier Building) for cash. The ECT folks agree with Mr. Wright that would be a very bad decision. Will Colorado Taxpayers Actually Receive a Marijuana Refund? In case you haven’t heard already, Colorado has been making a killing off of legal marijuana. The substance — which we’ve come to know by many names like reefer, pot, bud, herb, and gonja just to name a few — has brought in millions for the Rocky Mountain state. Colorado’s marijuana tax revenue data was just released for the month of September. Looking at this tax data, it appears as though the trend-setting state didn’t sell as much retail marijuana as it did during the month prior. But, in spite of the sales slowdown, the state is still earning enough cash from marijuana to have its citizens profit. Under the Taxpayer Bill of Rights (TABOR), Colorado citizens may even receive a ‘refund’ because marijuana revenues were higher than anticipated. During September, Colorado brought in $2.94 million from sales taxes on recreational marijuana alone. Considering a 10% tax rate, this means sales during the month of September were just under $30 million, which is a cool $3 million less than during the month of August when the state brought in $3.31 million in recreational marijuana sales tax revenue. On top of this cash, Colorado is still earning huge tax dollars from medical marijuana sales taxes (at 2.9%) which have brought the state over $900,000 during the month of September alone. It also earns money from the additional 2.9% tax it imposes on retail pot, and the 15% excise tax that’s imposed on suppliers, manufacturers, etc. What is TABOR and is it unique to Colorado? The TABOR is designed to be a kind of like a system of checks and balances. In Colorado, the TABOR limits the amount of revenue growth to the sum of the state’s population growth plus any increase in the rate of inflation. This means that if the population were to grow by 2% and inflation were to grow by 2%, available state revenue can increase by no more than 4%, unless voters approve an increase. Learn About Carrying Credit Card Balances. Other states have brought similar TABOR legislation to the table in the past, but Colorado is the only state that actually has such a policy in action. The 2014 annual meetings of the TABOR Committee and the TABOR Foundation are scheduled for 10:00 AM on November 15th at 13952 Denver West Parkway, Building 53, Suite 400, Lakewood, Colorado. Please try to attend these important meetings.